New Hibs signing Chris Humphrey had hoped to re-establish a partnership with Grant Holt forged at Shrewsbury Town. But with his old friend left on the bench last night, the winger simply formed an immediate bond with Jason Cummings, who grabbed a match-winning double to put daylight between the leaders and title challengers Dundee United. Second-half substitute John McGinn sealed the points three minutes into his return from injury on a night when things truly did fall into place for Hibs. McGinn’s immediate impact emphasised the strength of depth now at Neil Lennon’s disposal in the second half of the season. But it was Humphrey who caught the eye before he was replaced to acclaim from the home supporters with seven minutes left. The winger enjoyed a sensational debut at Easter Road as the hosts swept their title rivals away in the opening 30 minutes. Paul Dixon was the left back given the thankless task of reducing his threat. Without an appearance since October, Dundee United might have hoped Humphrey would be a little rusty. He quickly disabused them of this notion by claiming two first-half assists for Cummings. The first might have been slightly fortunate in that a skewed shot fell into Cummings’ path. But his wing play for the second was sublime, including a first touch to take him away from the harassed Dixon that was enviable given his recent lack of activity at Preston North End. Humphrey had made self-deprecating comments on the eve of the fixture about needing time to get into his stride again. Few had dreamed he meant a couple of minutes or so. On a night so un-seasonally mild to make a mockery of the winter break in the league above, no one could complain about the Premiership’s ceding of the spotlight to the division below. Perhaps only United fans felt a little let down at the abject start made by their favourites. Indeed, they never really got going and now trail leaders Hibs by four points. This was a game they were desperate not to lose but this seemed a forlorn hope from soon after kick-off, by which time Scottish football had been re-introduced to Humphrey in emphatic style. Lennon’s bravery in handing Humphrey a start and pairing him with the equally speedy Martin Boyle on the left flank was rewarded. Ray McKinnon’s side, by contrast, lined up too narrowly and paid the cost. There were empty seats in the away end though it was difficult to expect Dundee United to fill an entire stand on a Friday night. But there wasn’t any space in the home stands and Hibs responded to the loud backing by pouring forward from the first blast of Willie Collum’s whistle. 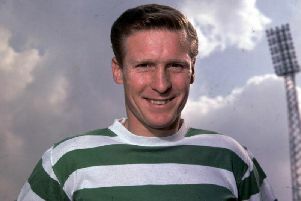 Humphrey was at the heart of this early spell of pressure and had already nearly set up a goal for his new team before slightly unwittingly laying on Cummings’ opener after six minutes. He galloped past Dixon and sent in a dangerous cross that United were relieved to see Lewis Toshney, absent from the original team-sheets handed out to reporters, in the right place at the right time to head clear. Hibs kept up the pressure. United conceded a corner which Kris Commons sent into the box having first removed an object thrown at him from the away end. Willo Flood did his apparent worst to clear and Humphrey’s shot, while similarly mis-hit, found Cummings, who turned and placed a shot under Cammy Bell. Hibs, at this point, were irresistible, the pace of Humphrey and Boyle causing United countless problems. A long ball from Commons found Cummings on the right, who returned it to the back of the box for the on loan Celtic player, who’d continued his run. A strong shot from Commons was blocked. But it seemed just a matter of time until Hibs added a second and they did so after 26 minutes. Humphrey again stepped on the accelerator after cushioning a pass into his path. But significantly, he also had the composure to pick out Cummings, who’d made an intelligent run to the near post. The striker flicked the ball past Bell for his 12th goal of what is becoming another productive season despite a spell when he was making infrequent starts. As for United, there was little to write home about. There was a Telfer cross that David Gray was forced to head clear before Nick Van der Velden connected at the front post. But that a poor return on a night when their fans hoped they might leapfrog Hibs and return to the top of the table. But it seemed a lot more likely that Hibs would add a third rather than United initiating signs of a comeback, although substitute Tope Obadeyi did come close with a header that was beaten away by Ross Laidlaw. Boyle took over from where Humphrey had left off in the first-half, tormenting Toshney with his pace but too often lacking the guile to replicate Humphrey’s effectiveness. McKinnon threw new signing Thomas Mikkelsen on for the last 15 minutes but the second loudest cheer of the half was when McGinn made his return from injury to replace Commons. The loudest was when he scored his side’s third three minutes later after taking the ball from a corner and shrugging off a listless challenge from Scott Fraser before placing the ball past Bell.